Another recent hit was a brand new BBQ joint just up the road from us, Oak and Embers Tavern. There’s not a whole lot of good barbecue around here, so this one came with high hopes, and delivers on all counts. We went with the whole family, so any place that can easily accommodate a dozen rowdies on short notice gets a plus. The inside is, I guess, pretty much what I’d expect a barbecue place to be. Rustic, rough wood, paper tablecloth (and crayons for all ages! ), no frills, and enough noise to ensure that quiet conversations are out of the question. It was pretty busy the entire time we were in, so business seems to be good. Of course, you know what you’re getting on the menu – lots of smoky meats (coming via a custom-built smoker) and lots of filling sides, such as the cheddar grits, cornbread muffins, and cheesy succotash. There are some non-barbecue options for those looking for lighter fare, but in general, if you’re here, you have a specific goal in mind. S chowed down on the pulled pork sandwich (in a very ladylike manner, mind you), which came on a brioche bun with chow chow relish. The pork was just to my liking, with some crusty edges, but nothing burnt. I don’t like burned food (I know some people like theirs black; not me), and there’s a fine line between “brown, crusty, and delicious” and “burned and inedible” for me, but they do a great job of staying on the right side of that line. 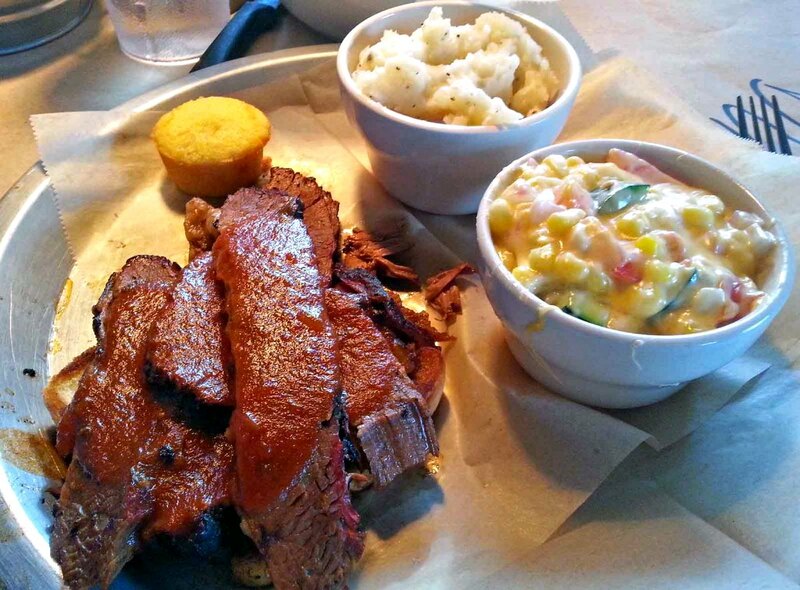 I went straight for the smoked goodness, and grabbed a heaping plate of brisket. The thick slices were piled high and drizzled with sauce (but not drowning), and came out smoky and tender. Between the twelve of us, I’m pretty sure we tried all the sides. They were all solid, but I really liked the succotash (with enough creamy cheesiness to accent the vegetables but not bury them), the smashed potatoes (just how I like them, chunky and skin-on), and sweet potato fries. The cornbread also comes through in moist, bite-size packages, but the grits were a little bland – could have used a little more sharpness from the cheddar. I’ll be honest: I’ve never been to Kansas City, Austin, or many of the other barbecue meccas, but for my money (or dad’s money, this time around), this is pretty darn good. The verdict: Oak and Embers gets 5 1/2 stars out of seven. The food was really good, traditional barbecue fare, the service was fun and attentive, and prices are family-friendly (everything under $17, most under $13). If you love BBQ, swing by for a visit and see what they can offer.